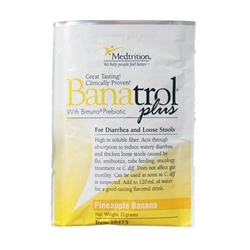 Banatrol Plus can be used proactively in cases where oncology treatment is known to cause diarrhea. Directions: Use 1 packet three times a day or as recommended by a qualified healthcare specialist. Depending on the type of diarrhea, it may take up to five days to take effect. Oral Use: Mix with 4oz (120mL) of water. Tube Feeding: Patients should use original Banatrol Plus.